Sweet Cheeks and Savings is helping with promotion of this giveaway! Good Luck! The writers (one of them at least) at Life of a Mad Typer are addicted to trendy new gadgets, and we are so pleased to share them with you. 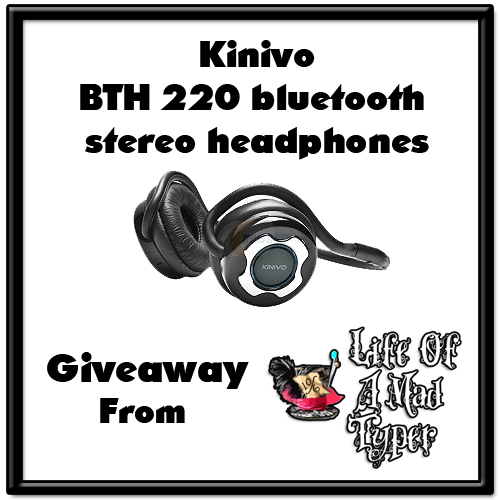 Our amazing friends from Kinivo are sponsoring a "BTH220 Bluetooth Stereo Headphone - Supports Wireless Music Streaming and Hands-Free calling" Giveaway. One of our lovely readers will own these wonderful headphones. Check our review to know why you are going to love your new headphones and how versatile the Kinivo are. This giveaway is Sponsored by: Kinivo. Prize: BTH220 Bluetooth Stereo Headphone - Supports Wireless Music Streaming and Hands-Free calling. Retails value is $44.99(approx). I would give these to my son. He has really eclectic taste in music. Country, dubstep, classic rock, pop, electronica. Rock and oldies...70's, 80's are the best to rock out with.